Hey folks, Valkor here. When I'm not chipping away at TOV or working my regular job, I'm usually plopped in front of the TV screen watching cartoons. South Park, King of the Hill, and Futurama are my regular staples. But that's at night. During the day time there isn't much that would interest me… that is until I discovered Johnny Test. 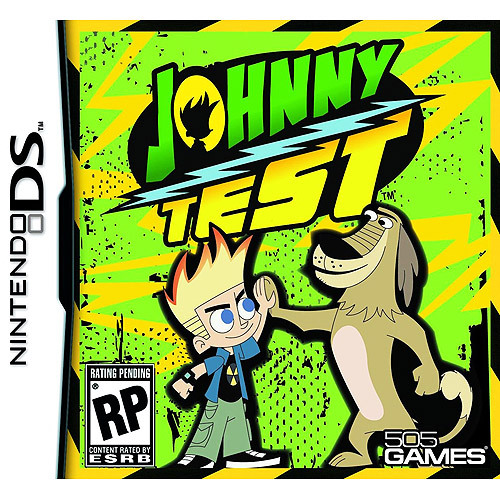 And thanks to the folks at 505 games I can enjoy his wacky antics any time of the day… though the journey is a short one; introducing Johnny Test the video game for the Nintendo DS. Before we dig into the game, here's some backstory. Johnny Test, a creation of Scott Fellows and airs on the Cartoon Network, is about this kid named Johnny, who unwittingly becomes a guinea pig for his super smart twin sisters – Susan and Mary. Though at times they use him for experimentation, he sometimes wanders into their lab to gain items for his own adventures. Now here's the sticky – any situation Johnny gets into has to be completed by dinner time… or his dad grounds him. By his side is his ever faithful and talking K-9 companion Dukey, who sometimes serves to give Johnny advice, but usually he ends up going along with whatever Johnny does. 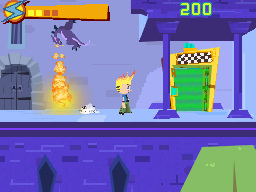 As for Johnny Test the Video Game, you'll play as Johnny as you hop, bop, fly, and shoot you're way through three worlds, each broken into different levels (12 levels total). In the first area, Johnny messes with his sister's "real life simulator", turning their town of Porkbelly into medieval hell, he second it becomes a winter hell and the third a robotic hell. OK hell is an extreme word, but you get the idea. And to make matters worse, the love of his sister's life, Gil Nexdor, has also been kidnapped. And it's up to Johnny to save the day… since he was the one that caused the mess in the first place. 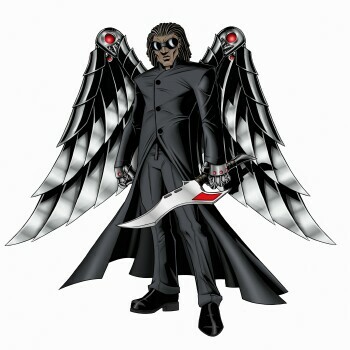 At the start of each world, you'll control a different version of Johnny – medieval world is standard Johnny. Frost world is Johnny X, and the final robotic world is Trooper J. Each representation of Johnny has their own set abilities, other skills you'll have to unlock. And in order to do that, you'll have to collect a number of nuclear reactor symbols called power cells. Overall play mechanics are simple; you'll guide Johnny through each world, exiting through doors until you reach the final door. Of course the final stage is where you'll battle a boss character such as Bling-Bling boy, Brain Freezer, and Mr. Whack-O. No stylus required here, you control Johnny using the D-Pad, jump with B, and use his standard weapon with A. The Y will always be your speed boost and X will be your special weapon. You'll guide Johnny through each level attacking/avoiding enemies, jumping over crevices, and avoiding other obstacles that might hinder your progression. I mentioned earlier that you have to guide Johnny to these doors that will lead him to the end of the level. 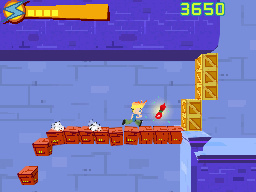 This extends the game as there are multiple doors that can lead to the final. But there's also a red door that leads to bonus areas, where Johnny can collect power-ups, extra lives, and more power cells. Unfortunately some doors are blocked and the only way to get to them is to unlock key weapons. Fortunately you can return to previous areas once you've gained the gadget to gain access to the door. The same goes for special items as well. To sum it all up we have a simple platformer that's based on a popular kids show. Obviously I'm not the market for this game, but I am a fan of the show. And as I'm sure I can't possibly be the only adult that loves the show, I don't think I'll be the only adult to play this game. And now, on with the TOV Breakdown. 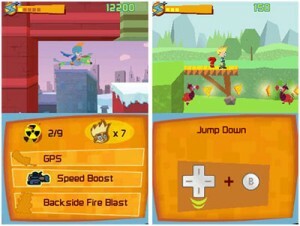 Johnny Test is a simple side-scroller that follows all the rules of what a side-scroller should be (run, jump, shoot stuff, complete). If you're a fan of the show – young or mature, then this is a no-brainer; get this game. If there were more animation and maybe some voice, then you would essentially be "playing" the show. 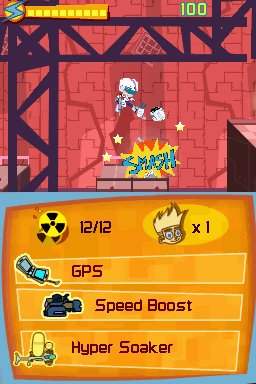 The Johnny Test cartoon is all about him getting into and out of trouble and the game follows that same premise. Controls are very easy to get into (again it has to be for its target audience) and I love the music, which sounds if it could be pulled direct from the show (and I know some of the tunes were such as the opening theme – but no vocals). In the end we have a solid platformer, based on a popular license that's actually good. I'd say that's a win in my book. But then this happened. Ok first off, even for little kids, the game is just way too easy – even on stages that would appear to have some difficulties (the robot levels). The enemies are just too easy to kill; all it takes is a stomp (though some need more stomps than others). And that's just the first stage. When you get to the later levels and you get ranged weapons, then it's all over. Because when that happens, especially when you become Trooper J, you can kill enemies off screen. You're only real difficulties are the boss, but their patterns are so easily recognizable that you'll polish em off in no time. And the graphics don't do this game justice. I feel the PSP would have been a better portable to place this game. Why? Better graphics, voice, animation (this game uses stills), maybe more weapons, better everything! And speaking of the weapons – yea, needs more! Not only that but I wanna make use of them too. In this game, you don't really need the special weapons but to unlock/unblock doors and items. Sure you can use them to take out enemies, but you don't need em, when the stomp or your basic weapon (when you use the alter ego characters) works just fine. Finally the graphics, when it comes to gameplay, do not represent the character or the world he encompasses at all. Scratch that, the backdrops look great it's the actual characters that are blocky and not very easy on the eyes. I really want a bigger version of this game. 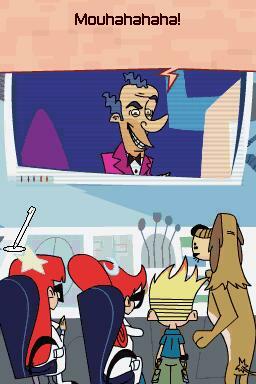 Though my list of bad is kinda long, I don't feel that Johnny Test on the Nintendo DS is a complete waste of time. Actually it was a lot of fun and really followed the premise of the show to the letter – more or less. Would I like to see Johnny hit the bigger consoles? Absolutely! Until that day, I consider the DS version a taste of things to come. And out of TOV 5 stars, I give the Johnny Test Video Game 3 stars. And it's been Valkor tested, TOV Approved.